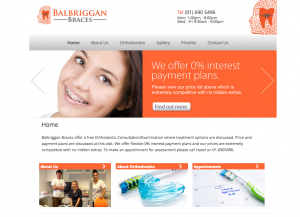 We’ve recently launched the brand new website for Balbriggan Braces, Dublin Orthodontic Clinic. Balbriggan Braces offer complete orthodontic treatments for adults and children, fitting braces to help straighten teeth. They also provide a free initial consultation to discuss the cost of your brace fitting, as well as 0% interest payment plans to spread out the expense throughout the treatment. Their brace fitting price list includes the full cost of the orthodontic treatment, from initial fitting to x-rays, as well as the removable retainers to be worn after the braces are removed.